Well, hello strangers! I kind of disappeared for a while, and I’ve missed y’all terribly! The last couple of weeks have been a bit crazy, but not really in ways that make for interesting DIY blog posts. I spent a few days packing, boxing, organizing, and moving things to storage. Then I got totally sidetracked by a crazy person threatening me with a lawsuit over a negative review I wrote of his company / product, and the attention it has received in the last year…blah, blah, blah. But now, I have no more time for distractions. I need to get on the ball here!! 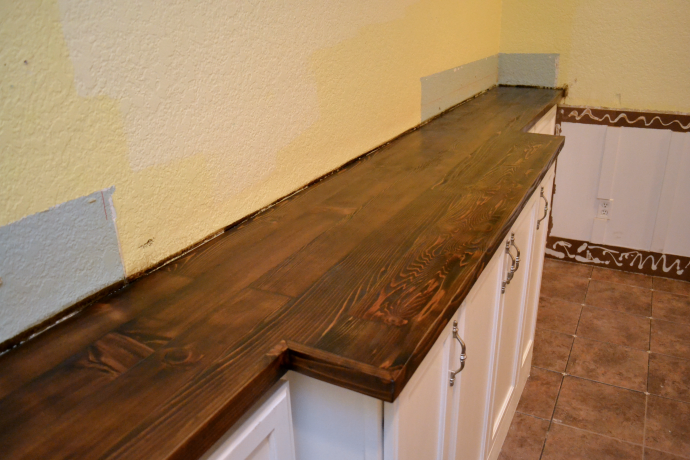 Oh, and I also re-sanded and re-stained the countertop. So, that’s what I’ve been up to. What have you been up to lately? 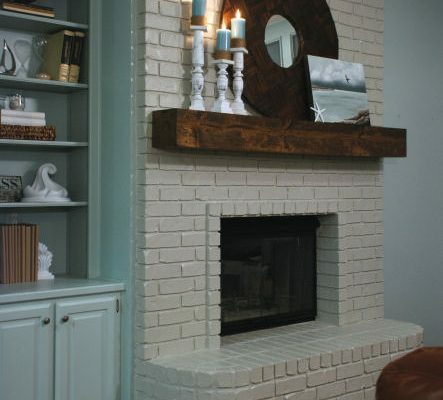 Have you finished any amazing projects around your house? I think you and I work the same way. 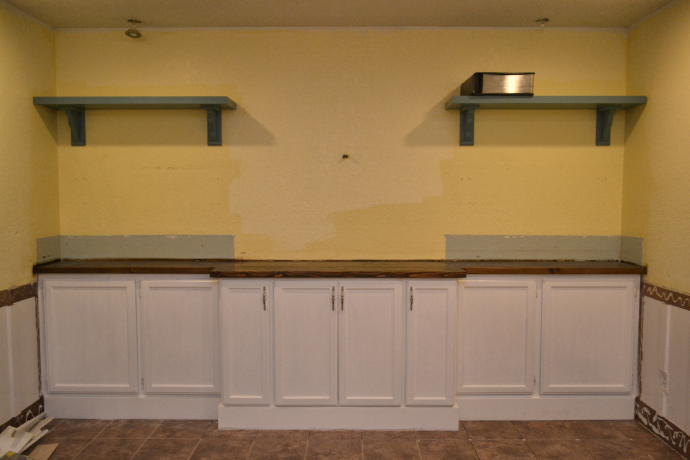 I pretty much ignored my kitchen reno last week. I’m off to get the new floor in and hopefully finish the counter and the trim work this week. Here’s hoping! I love it when an update pops up from A2D in my newsfeed! 🙂 The new color is better, love it. As soon as I started reading that sentence about you having to redo it, it reminded me of your kitchen counter saga and you were probably flashing back to the same thing! I love how that whole wall is looking. I did like the old color but if it turned a nasty gray, then it wouldn’t work. The new color is nice and should work well with the brighter walls. To be perfectly honest, I’m not sure I’d put handles on the 4 remaining doors. 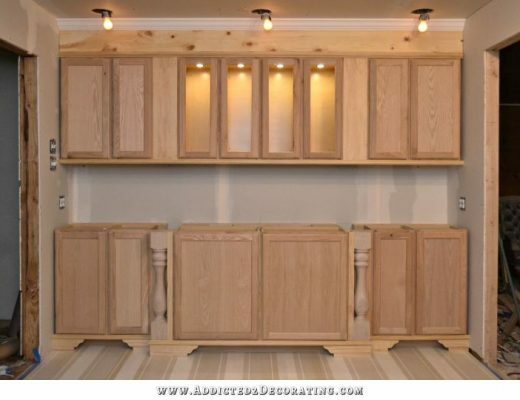 I understand that it would probably be for the best but those recessed cabinets look a lot like your wainscoting and help the cabinets blend in. I like that. : ) Great job, so far and can’t wait to see what your next step will be. I love this blog! If you get your cat thing built before I start mine, I want to see yours!! You might make some design changes that I want to incorporate into mine. 😉 I just think it’s the most brilliant thing ever. My cats sit there at the windows, looking out longingly, making the cutest little sounds when the see birds. They would LOVE going outside! Sooooooo good to see you back. And your wall is becoming wonderful! I thought about you today. I’m remaking my Master, and painted the furniture. One item I painted with too light a green and it doesn’t go with the palette I’m working with. I asked myself, “What would Kristi do?” and I answered that she’d simply repaint it the right color! So, out to Lowes tonight for paint chips. Soon as I get back home after my mini vacation, I’m going to get to it. Haha! WWKD? 😀 Yep, I’d repaint it the right color! Hope it turns out just like you want it! Kristi, Truth is an absolute defense to defamation: if what you say is true, it cannot be defamatory. Another defense to defamation is proving that the statement was an opinion, not an assertion of a fact. I’m sorry to hear you had that distraction! The Dark Walnut is beautiful. Finally, you haven’t seen your in laws in 8 years? Enjoy your time together! Thank you for this, Brenda, you took the exact words out of my mouth! Kristi, Brenda is right about this, that man probably has no actionable claim against you. That said, anyone can sue anyone for anything, and it can take a while for a lawsuit to go through the court system before a judge will decide the claims have no merit, and a person of their attorney usually has to move to dismiss or for summary judgment based on meritless claims. *IF* this turns into something where this man actually files a lawsuit and serves papers against you, please immediately go to some place like Legal Aid or The Public Law Center or to someone who does pro bono work so they can address these claims for you and attempt to have the case dismissed as quickly as possible. Hopefully this has already resolved itself and you won’t have to even bother with any of that. I like the color of the countertop, it’s very rich. I’m only sorry you had the added work of a re-do! It’s good to see you back blogging! Thank you to both of you for that info. I’ve read my review a hundred times, reviewing every word to be sure that all of my claims could either be substantiated with factual evidence, or that they were presented as my own personal opinions. On top of that, the review is over a year old, and I spoke with an attorney who said that in Texas, the statute of limitations on defamation is one year. So even if it did contain defamation (which it doesn’t), the statute of limitations has passed. This is chilling to all of us who leave reviews on Angie’s List, Tripadvisor, Yahoo local, Yelp, to name just a few. I hope it just goes away, as it should! Well, mine was a pretty loooooong, and detailed, and very thorough review that I posted here on my blog. 🙂 But even still, everything I said was either my own opinion, or can be substantiated with provable facts. There are businesses out there who purport to help improve “internet profiles” of clients. Hearing about your experience, I wonder if one of these services is behind it and if one of their “tools” is to pressure bloggers or nonbloggers like me to delete our posts in the face of legal threats. Kristi, I’m so glad to hear the statute of limitations has run out for this guy. It really irks me that someone would attempt to intimidate you like. All someone would have to do is read your blog to see that you are a very rational and calm person who states opinion and fact clearly and honestly, and is not prone to hyperbole (like I’ve seen on some other blogs!). I sure hope you didn’t take your review down, other DIYers like those us who read your blog need that kind of information. We as consumers are so bullied as it is, like Brenda mentioned, even honest opinions on places like Yelp are filtered and with the trend of “internet profile improvement” businesses, we consumers are even being robbed of our voice on those review sites. If a business wants to get and keep reasonable customers, then they need to either provide a product or service that actually works the way they promote it will, or they need to be honest with themselves and remedy any issue a reasonable consumer may have with their product or service. So many businesses view it as an “us or them” situation, and/or provide really rotten products or customer service, so they don’t deserve the customers they do have and it’s fair game to warn others away. It’s all part of a free market economy. Keep up the good work ! It’s getting there and looking amazing. 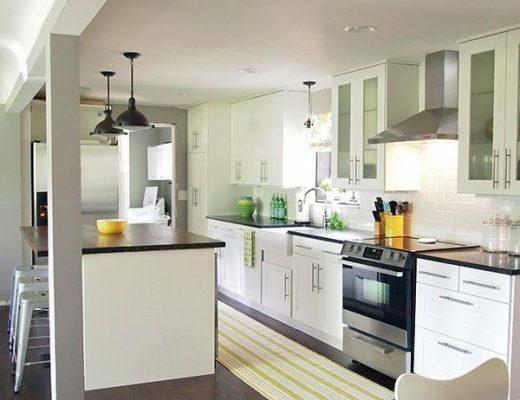 Love the finish of your counter top especially with the white cabinets, looks sharp! Kristi I love it! The most wonderful things happen from oophs! It really looks like you’ve got alot of motivation for this kind of stuff, I could never of done this, good job!. How come you chose a combination of Early American and Special Walnut stains?. 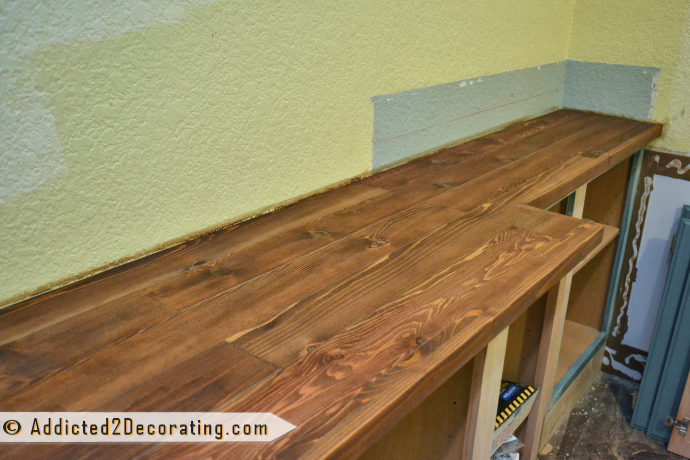 How did you mount the Trim to the outside of the countertop? another Jig trick?